The perfect birthday combo for anyone! When you send these birthday flowers, you can be sure that the recipient will feel loved! Large 18" Helium Balloon included. Our florists have chosen chrysanthemums, carnations, Marie Claire roses, and hypericum for this Happy Birthday bunch. 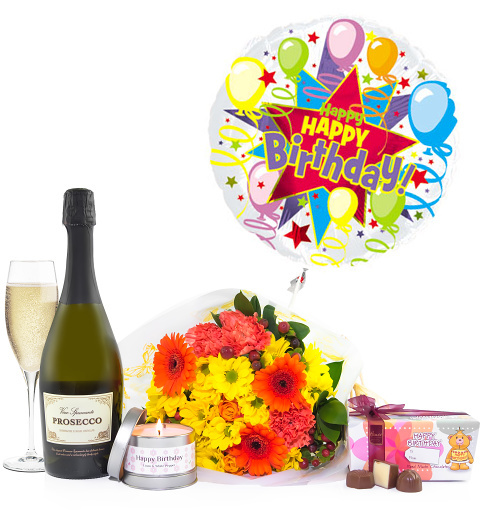 This flower combo also includes a gorgeous Happy Birthday candle, a 75cl bottle of Prosecco, a 130g box of chocolates, and a wonderfully bright birthday balloon filled with helium! Available for UK next day delivery, this is one gift that you can rely one!